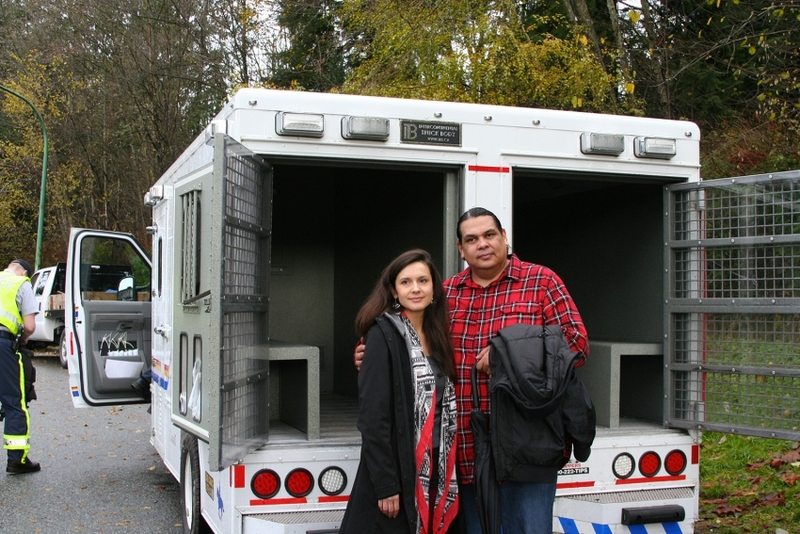 After helping his mother, the Tsleil-Waututh elder Amy George, cross the police line at the lower Kinder Morgan drilling site on Burnaby Mountain, Rueben George led a procession of family members and supporters through the forest trails, down to the site where she would eventually appear for police processing. George and others gathered on Ridgeview Drive, a street in a local Burnaby neighbourhood where police vans had parked, ready to receive the arrestees. They were protesting the Trans Mountain pipeline expansion. While waiting for his mother to emerge from the mountain trails, George told the Vancouver Observer that he was worried about her "because she's in her 70s" and "has arthritis." "But she's a warrior" he continued, "She's the one that said 'Warrior Up.' But I'm still worried, she's still my mother." Rueben George and Melina Laboucan-Massimo of Greenpeace Canada awaiting Amy George on Ridgeview Drive. Photo by Peter Morelli. When asked to comment on the day's events, he spoke about his mother's example, and the leadership of other First Nations elders, such as Grand Chief Stewart Phillip, who was also taken into custody by RCMP today further up the hill. "My mom, first of all, is amazing. What I've been taught is to have an intimate connection to the lands and to the waters and my mom she stood up and she expressed what you should do when the things that you love are threatened, and she got arrested — with Grand Chief Stewart Phillip, too, who is also an uncle of mine." "It is so touching and beautiful to see our elders leading the way to make sure that we all have a better future." "I'm really touched. It's really emotional. The actions of what they're doing is not just for us as Tsleil-Waututh people or the First Nations of British Columbia, it's for everybody. Our actions and what we do are for everybody." 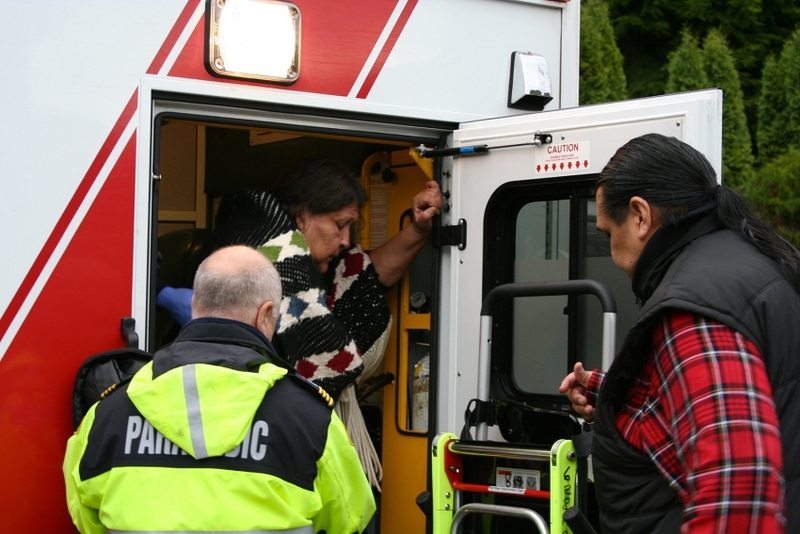 When Amy George finally appeared from out of the forest in the company of Grand Chief Phillip, she was escorted by RCMP and supporters to a waiting ambulance where paramedics assessed her health and ensured that she was in a stable condition. Rueben George stood near the entrance to the ambulance while the paramedics worked, waiting for his mother to emerge. Once the paramedics had finished checking over Amy George, she exited the ambulance and greeted her anxious son, who was pleased that his mother's condition was stable. Amy George emerging from the ambulance. Photo by Peter Morelli. Both Amy George and Grand Chief Phillip were soon inside a police van and were driven back up to the top of Burnaby Mountain and the main protest site on Centennial Drive. Neither of the two First Nations elders were charged by the RCMP in keeping with the discretion the police have shown in releasing elders and seniors without charge, and also in keeping with Justice Austin Cullen's announcement today that all charges of civil contempt for protesters arrested so far on Burnaby Mountain would be thrown out. Rueben and Ta'ah Amy George. Photo by Peter Morelli.